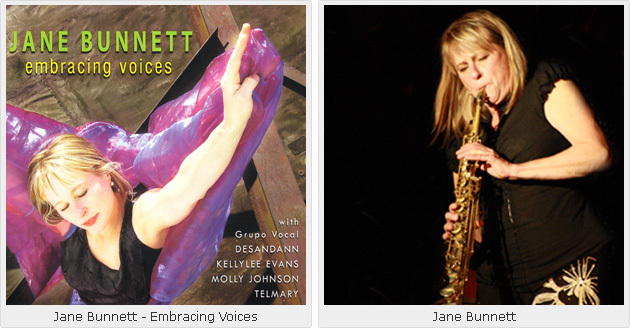 Jane Bunnett is never afraid to push the envelope. She did so with her 1988 album, In Dew Time, the now out-of-print vinyl that was produced privately by the Toronto imprint, Dark Light, on which producer, husband and trumpet/flugelhorn player Larry Cramer scooped both keyboard player Don Pullen and saxophonist Dewey Redman. Then followed an extraordinary slew of records, from those featuring Pullen—New York Duets and Live at the Sweet Basil (Music and Arts Program of America/Denon, 1989 and 1990 respectively—to her triumphant Cuban expeditionary albums throughout the 1980s, 1990s and the first half of the 2000s. Bunnett and Cramer, who conceive and craft each music project with a gospel-like fervor, have never shied away from the road less traveled. But it is Spirituals and Dedications (Justin Time, 2002), which is—in many respects—the herald of Embracing Voices, a bravely challenging and spiritually complete (in the John Coltranesque sense) record. Few instrumentalists in jazz have honored the human voice with such an all-embracing intensity on a single record. Through the history of the music there have been instances of vocal music—from the earliest blues shouters down to Bobby McFerrin’s extraordinary work with keyboard player Chick Corea, the St Paul Chamber Orchestra, his own Beyond Words (Blue Note, 2003) and the choral work of Take 6—but no single record has attempted such an all-embracing sweep of vocal/choral/instrumental music as Embracing Voices. This is a major project that honors the human spirit featuring the unique scope of the human voice and brave rhythmic, melodic and harmonic explorations into the extent of a breath of musical instrumentation. The result is a record that has been made with a large instrumental group —fourteen instruments creating a musical bed for the heavenly choiristics of Grupo Vocal Desandann, the legendary ten-person ensemble that celebrates the legacy of Haitian a capella music in the Camagüey region of Eastern Cuba. The choral group employ dense harmonies, intricately woven into call-and-response segues and contrapuntal structures. 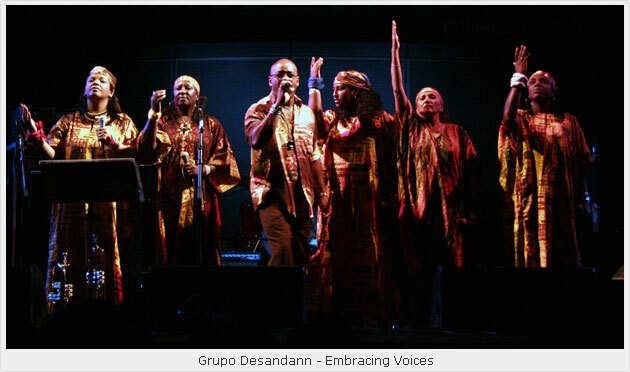 But it is the perfect tonal tapestry of Grupo Desandann that makes for one of the most distinctive 10-voice choir in music. Stately basses grind con arco together with the trill of the high-flying soprano voices both ranges held together by the impervious glue of the contralto and counter-tenors in the middle. Often these are melded with the bright skittering of the tres guitar and the rumble of the congas and tumbas, punctuated with the melodic clunk of the claves. On this record lead voices occasionally arise from the five male and five female singers like waves in an ocean of sound. Lead voices have also been crafted to include the rich sonic tapestry of Telmary Diaz’s rap, the soaring, soulful inflections of Kellylee Evans’ pipes and the gravelly and emotionally-charged blues of Molly Johnson, who leads the cast in one of the most definitive versions of legendary Belgian troubadour Jacques Brel’s “If you Go Away (Ne me quitte pas)” since Nina Simone. The music runs the gamut of emotions that could possibly be sung by human voices, from the bluesy and melancholic to joyful and even ecstatic. Arrangements follow suit. There is a wonderful interplay of instruments, which provide impetus to the human voice and surround it with rich tonal colors. Larry Cramer’s trumpet—muted and open-belled—and flugelhorn brighten and darken moods with subtle shifts in notes and spaces. Don Thompson’s vibes do the same. Throughout it all Bunnett’s lead voice whether it be on soprano saxophone and flutes soars with infinite abandon—just as Coltrane and Eric Dolphy did on the “Africa/Brass” sessions—in and out of interstellar space. The record opens with “Sway,” a fine composition that begins with a series of quarter notes sung a capella by Desandann before a drum roll that introduces the bass pedal point and the repetitive hypnotic riff draws in the rest of the group into its spirit-based musical vortex. The changes in the opening segment of the track are reminiscent of those on “India,” the famous chart introduced by Coltrane and Dolphy, but only the top half of the chorus. The minor-chord spell is broken in the bottom end of the song as it breaks down into a series of rapidly descending diminished chords that dramatically change mood of the song like the sun cracking open a dark sky to bathe everything in light. “Kaleidoscope,” which once again features rich, minor variations at the start of the song, then proceeds to unfold like a vocalese poem, accompanied by flute and the militaristic rattle of a snare drum punctuated by splashes of cymbals. Bunnett’s flute takes a soaring solo as the emotion of the song is built up for Thompson’s vibes. The rhythm by now has quietly shifted into a backbeat of a samba. Tres and percussion herald the entry of the full complement of the vocal choir and other instruments and the bass voice, from Desandann soloing as the bass anchors in the Afro-Cuban segment that breaks in with timbales, cowbell and guiro—the cue for Cramer’s flugelhorn, which in turn re-introduces Bunnett’s flute as it intertwines with the voices as they add layer upon layer to the music as it builds up to an explosive finale. The voices of Desandann then introduce us to the purest pain, on the deeply traditional Afro-Haitian coloration as the sopranos and mezzo-sopranos launch into “Wongolo,” followed by the rest of the voices. “Wongolo” is simply the most beautiful Haitian freedom song that says, “We will rise again…Haiti will not die…” Bunnett slides in with her own soprano voice behind a medley of percussion, daubing the music with music with light touches of brightness as it twists and turns bringing in the piano and the rest of the instruments before the song explodes ecstatically with voices and instruments melding into tres and marimba. 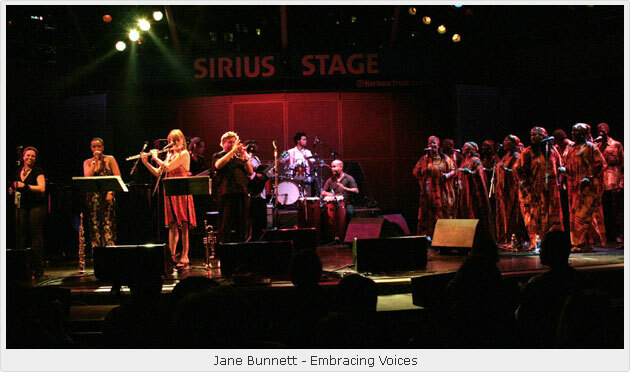 Bunnett’s flute flits like a firefly around the voice of Kellylee as “Serafina,” a bright work that is infused with the rhythmic intensity of a Cuban rumba and a streaming R&B romp into landscapes that cascade one into the other. The classic Jacques Brel/Rod McKwen chart, “Ne Me Quitte Pas” is next. This version is darker than most that have been sung. Bass and drums dominate the rhythmically intense arrangement, which heats up the gravelly voice of Molly Johnson as she describes the emotion of the break-up of the intense love affair. In the bridge that heralds the second mood that offers reason for staying vibes and piano create a brighter mood—but we are always reminded of the tragic circumstances of the principle character in the song by the choral bed that is provided by Desandann. Bunnett’s soprano saxophone—delicious in its lower register and skittering notes—and Thompson’s vibes have been showcased by the exquisite arrangement, especially after the final chord change moves the music into a major seventh. “Pancho Quinto” pays tribute to the legendary Cuban percussionist in a novel manner: Telmary Diaz’s rap in counterpoint with the folksy son of Desandann, with flute, vibes, tres, conga and bass woven into the tapestry of the song. And if you thought that the folksy break would go on into the sunset, the interplay of voices, including Telmary’s street rap and Desandann’s spectacular smoky basses, wind up then down with the many-splendoured percussion leading the music into the fade. “I Hear Voices” is as spectacular as it is angular. The track melds Cramer and Bunnett, muted trumpet and flute and scatting voices in another minor mode with guitar. A vehicle for the viola of Barry Schiffman, co-founder of the St. Lawrence String Quartet in Banff, Alberta, and the acrobatic flute of Bunnett and an almost vocalese version of a solo from Pablosky Rosales. Pianist David Virelles is also superb in his energetic modal solo. Bunnett soars high, just as the late Dolphy, on one of his famous sonic expeditions. Bass and drums maintain a riff based on the pedal point. This track too is reminiscent of Coltrane’s “Africa/Brass” songbook. “Chen Nan Ren,” a protest song, is also a song of fervent hope, almost a prayer. Call response in Creole and French as voices—sopranos and basses intertwine—like dappled colors on a sonic canvas with the muted ring of the marimba and growl of the bass. Both duel gently with Cramer’s trumpet and Bunnett’s flute weaving in and out of the hypnotic voices of Desandann. Like an African prayer service. “Egberto” is Thompson’s tribute to composer Egberto Gismonti. This extraordinary and exquisitely complex track was first performed for Gismonti himself in Toronto. The track gathers the voices of Desandann together with the rest of the instruments: Cramer’s is first to break as the a capella section describes a descent into a somber mood, soon to be brightened by Bunnett’s soprano and the voices of Grupo Desandann, which bring a somewhat calming effect until Thompson’s vibraharp takes over and shows why he is one of the finest on the instrument, where the blues of Milt Jackson and the soaring classicism of Bobby Hutcherson are reflected in his Thompson’s unique, individual voice. Then Bunnett again working her soprano in slow circular phrases from the bottom to the top of the register in a magnificent cascade of music. “A Nu Danse” has a feel of almost being a classic descarga. Handclaps and voices with percussion introduce another intricate Haitian Creole and call/response before the conga soprano unaccompanied by anything except handclaps and voices. Cramer joins in the festivities with a single chorus on flugelhorn followed by Thompson on vibes—samba and Santeria and African rhythms and European marching all rolled into one. Bunnett returns to soar above the theme until the close. “Pa Gen Dlo” is perhaps the most fascinating and boldest experiment on the record. Part 1 is a short meditative vehicle for Bunnett’s saxophone and piano. Hypnotic, mesmerizing, a duet with piano and saxophone doing what voices did throughout the record. In Part 2, a capella voices create a prayer that wraps itself taut as the colors in Grupo Desandann voices unfold in gorgeous harmony. Sheila Jordan’s “The Only One” brings the record to a close. Kellylee Evans leads and Bunnett, in her inimitable way pizzicato style, with minimum glissando, draws Desandann in as the song unfold like a cross between a blues and a slow rhumba with a melody twist that leap harmonically as it builds to the cinquillo rhythms of the bata drums that shook up the rituals of voodoo in Haiti and Santeria in Cuba. Bunnett’s reference to “Ornithology,” as the voices improvise on this theme—in the brassy backend of the song—is repeated until the music fades. Somehow the magical music of this set echoes seemingly forever as the notes disappear into a seemingly nocturnal soundscape. 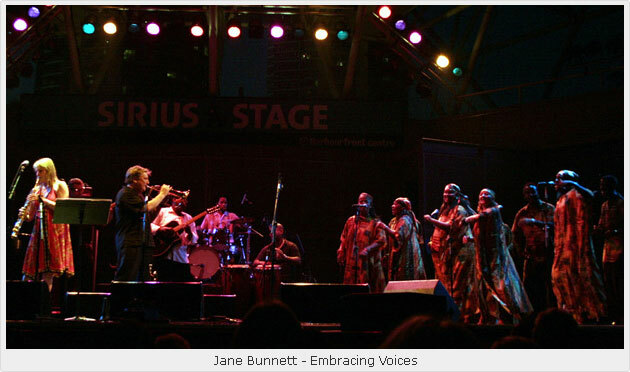 With the release of Embracing Voices this journey made by Jane Bunnett, which began almost two decades ago, reaches a new peak of sorts. This record is going to set the standard by which vocal music and instruments make music in harmony. Both Jane Bunnett and Larry Cramer, who is an important a partner in the project, in terms of being its producer as well as an important musical contributor, should be justifiably proud of such a recording. Finally it has been a while that the legendary Don Thompson has opened the door to his musical genius. On this record he plays bass, piano and vibraharp, arranges his own compositions, “Egberto” and “If You Go Away,” and as Bunnett herself suggests, is, with Bunnett and Cramer, a towering presence amid a group of musicians looking to make a significant contribution to the art of jazz. Any label that is bold enough to stand by music of this Afro-Cuban jazz kind deserves high praise for being brave and brassy in backing high creativity over rank popularity. Tracks: Sway; Kaleidoscope; Wongolo; Serafina; If You Go Away; Pancho Quinto; I Hear Voices; Chen Nan Ren (Protest Song); Egberto; A Nu Danse; Pa Gen Dlo (There’s No Water); The Only One (For Sheila Jordan). 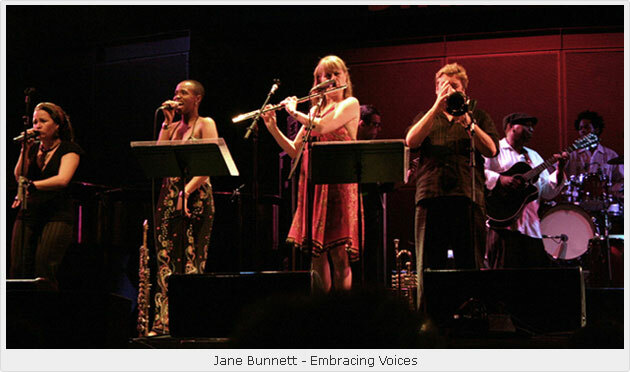 Personnel: Jane Bunnett: soprano saxophone and flute; Larry Cramer: trumpet and flugelhorn (1-3, 6-10, 12), producer; David Virelles: piano and marimba (1, 3-5, 7, 10, 12); Don Thompson: vibraharp (1, 2, 6, 7, 9, 10), piano (2, 9, 11), marimba (8), acoustic bass (5, 9); Junior Terry: acoustic bass (1-4, 6, 7, 8, 10, 12); Jorge Torres (Papiosco): bata (2-5), bata and percussion (7, 8, 10, 12); Frank Durand: drums and marimba (1-5, 7-10, 12); Pablosky Rosales: tres (2-5, 7, 8, 9, 10, 12); Barry Schiffman: viola (7); Grupo Vocal Desandann: vocals; Kellylee Evans: vocals (1, 2, 4, 12); Molly Johnson: vocals (5); Telmary Diaz: vocals and spoken words (6); the ensemble: coro.